Our weekly maintenance includes mowing your lawn to the correct height for the turf type that it is. We generally mulch the grass as its the healthiest service for the turfgrass, although sometimes we may need to bag the grass if we deem it impossible to make look nice by mulching. We also edge all concrete areas including the back patio if you have one. We finish by trimming around all of your landscape and house, then blow off all walkways. 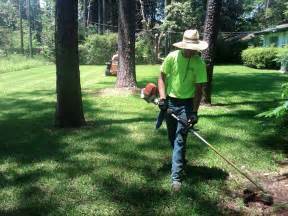 We offer several different programs for the different turf types that we have here in northeast Georgia. We tailor our program to the turf type that you have, whether its Bermuda Zoysia or Fescue. We take pride in our program and customer satisfaction is our number 1 concern. Email us today and we will have a look at your turf and discuss with you a program that fits your goals. 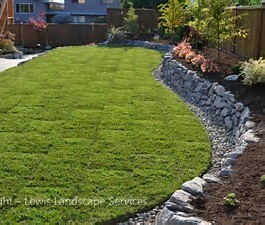 Sod installations, seeding, and hardscapes are all a large part of our business. Whether you need maintenance on your current landscape or are in the mood for a new installation, Simply Lawns and Landscapes is here to help. We have all of the proper equipment to do the job correctly and efficiently. this allows us to give you a great price on your installation. Call or email us today for a list of the other services that we offer.